And so it ends. April 15 has come and gone, my winnings have been tabbed and taxed, the tribe has spoken. Not that the world took notice or anything. But there was commentary here and there. Wired News checked back in for a wry post-mortem. The gang over at Terra Nova opened a congratulatory thread. And e-mails trickled in from wide-eyed strangers the world over, wanting variously to know (a) how they too can quit their day jobs and make $3,917 a month selling imaginary suits of armor and (b) what lies next for me and Play Money. In answer to (a), all I can say, my friends, is RTFB: read the blog, from start to finish. There's not much I could tell you that isn't there already. As for (b), I wonder myself. In the near term, I do have a writing career to catch up on -- a contract with Wired magazine that I will have to hustle to comply with, a book proposal that needs some revising (can you guess the topic?). I have therefore decided to limit my trading, for the time being, to the buying and selling of Britannian gold pieces, the least time-consuming activity in the business. I will also be updating this blog much less frequently, if at all -- except to continue posting my weekly market report until I have compiled a full year of numbers, some time in June. Watch for pretty graphs upon completion. You may consider this entry, then, my farewell. And as such, it comes I guess with an obligation to share with you some thoughts on what this has all meant to me and, if it's not too presumptuous to consider, the culture at large. For me, I think, what this project has been about is the relationship between play and work. I began my involvement with Ultima Online as a player, and I took up this enterprise wondering if it might not lead me to an El Dorado I have looked for all my adult life: a place where work is play. It didn't, of course. Not exactly. It took work to make Play Money, and the work was hard, and more to the point, the work did not fit any definition of play handed down to us by tradition. It was not simply a diversion from the path of life; it was the path itself, for a time, and just as fraught with existential care as that path ever is. The funny thing is, though, that more and more nowadays this curious confusion of entertainment and existence is the definition of play. The games we choose for our amusement are becoming so complex, so involving, that the line between gameplay and career, between gameworld and society, begins to blur. In the course of this project, I met many players of UO who were just as much laborers in the UO economy, even if they wouldn't have said so themselves. I also encountered ethical dilemmas, questions of economic justice even, that would never have troubled me as they did if the economy in question were merely a game. What this says about the culture we are building, and about the strange promise of the technologies that increasingly shape that culture, I'm not quite certain. But you can rest assured that if the book Play Money ever gets written, these will be its central questions. Till then, as I said, farewell. And thanks, to all who made this possible. To my readers. And of course to my customers. To my fellow traders, who proved to my surprise to be as much my support network as my competition. To Markee Dragon, especially, who took me aboard his illustrious broker team on only the scantiest evidence I deserved the spot. And above all, for all the favors large and small he did me, to Mr. Big, who knows who he is. UPDATE: Mr. Big has let me know that at this stage in the game he doesn't mind letting the world in on his secret identity. UO market insiders will not be surprised (though I hope you'll be impressed) to learn that my mentor and number-one benefactor throughout this project is Mr. Robert Kiblinger, sole proprietor and delivery boy of UOTreasures, the top retailer in this business by far. Thanks again, Bob. As of a few hours earlier this evening, it's official: I have paid taxes on my income as a trader of virtual items. 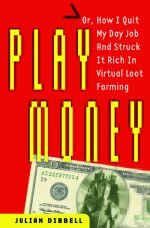 I listed $3,131 in profits from Play Money on my 2003 federal return. And in my Q1 2004 estimated tax payment, I included $2,056 to cover my $8,225 in Play Money profits for the year so far. That should leave me with a nice little sum to blow now on the indulgence of my choice -- a $4,000 ticket to the TED conference, say, or (as a gold-farming acquaintance of mine recently did with his revenues from retailers like me) a down payment on a Prius. It should, that is, and yet it does not. For it turns out, as the tax preparer informed me to my profound dismay late yesterday afternoon, that my wife and I still owe a whopping $6,650 on our 2003 income taxes. And thus, in the final, crowning irony of a project that has never lacked for ironies, the entirety of my assets in this improbable business must now be handed over to the government, there being no other liquid funds available to pay the tab. On the plus side, when I dropped by South Bend's main post office at 5:30 to mail the payments, they were giving out free Krispy Kreme doughnuts. Let me begin by saying what an honor it is to receive this handsome cherrywood-veneer plaque commemorating my third week in a row as Number Two Seller in the eBay Ultima Online market. I know that when my great-great-grandchildren seek someday to understand what the life of their illustrious ancestor was about, they will find in this single accomplishment the Rosetta Stone of my existence. I'd like to thank God and Meg Whitman for making it possible. As for that other accomplishment I've been pursuing here, well, today's the day, isn't it? I suppose I could wait to see how sales go tomorrow and mail in my tax payment at midnight, but let's face it: the numbers are in. And as predicted, they are short of the mark. Six hundred and eighty-three dollars short, to be precise. Even taking into account my shortened hours manning the store this week, sales were catastrophically slow, and my profits withered accordingly to $668.71. In the last month (31 days), I turned a profit of $3,917. Annualized, that's a $47,000-a-year gig -- nothing to sneeze at, of course, but nothing I haven't achieved as a professional writer, either. Game over: I lose. But where there is a loser, I am told, there must also be a winner. And I don't see anyone else here but me. Do you? Audited statements available upon request. And you'd think I'd be checking my profit numbers on an hourly basis at this point. But I don't dare. Or don't care. Not sure which. Sales have been slow the last two days, and Lola came home from day care today with a fever and instructions to stay out for 24 hours, so tomorrow's sales are bound to be even slower. My elusive financial target looks more elusive than ever. No regrets here, though. The Easter egg hunt alone was worth every lost sale. I hard-boiled half a dozen eggs, colored them with Hi-Liter, "hid" them around Lola's room, and held her basket for her as she went around finding them. "Hide them again," she said. And we did. Six times. I'm writing this on a 737 headed east from California, though of course I won't be able to post it until I get home to Indiana tonight. Strange to think that the truckstops of America have better networking tech built into them than the passenger jets. Strange, too, to be heading home so soon. I had meant to stay in L.A. until after the 15th, the better to finish out the project undistracted by travel and, I guess, domesticity. But the reasons I left home in the first place were never so practical. If you're good at reading between the lines, you may have guessed that things are not going well for my marriage. A brief cooling-off period was thought by all to be a good idea, and so I hit the road. But I never wanted much to be on it. So I'm flying home early now, for various reasons, none so clear to me as my desire to be there tomorrow when my daughter goes on her first real Easter egg hunt. And in all probability this means I have chosen that opportunity over the chance to meet my financial goal. The day of travel and the hours of child care now coming out of my schedule almost guarantee a reduction in sales this week. But it wasn't a very hard choice, to be honest. Still, I have to wonder why that choice, broadly speaking, seems to be a recurring theme in this chronicle. Remember that the project began in earnest with a similar separation, and a similar push to reach a near-term business goal, 10 months ago. That separation wasn't so obviously related to marriage problems, but the tension between work and family was much the same. Not that it has to be that way, of course. Indeed, many of the people I've talked to who trade in virtual items for a living say they do it largely because it lets them work from home, near spouses and children. Nonetheless, there's something about the nature of this work that forces the question. And it really boils down to the much simpler, yet more baffling question that I have asked myself every day of this job: What is it that drives people to spend hundreds and thousands of dollars (or what amounts to the same thing, hundreds and thousands of hours) to get their hands on playthings they can never really hold? I still don't know. But more than ever I suspect it's the same thing that drives people to value the playthings of material life in general, the trappings of success, the visible tokens of accomplishment that keep us on the treadmill of production and make the economy go around. I don't say this in judgment of my customers (may they ever prosper). If anything, they're closer than the rest of us to the sort of enlightenment that frees you from the treadmill, if only because they know that their striving is just a game. May we all know it sooner or later. Soon enough, anyway, to see and hold the things that matter. As for the things that pay the mortgage, my sales yesterday included 40 million gold pieces, a couple of high-end suits of armor, an extremely rare weapon known as the Staff of the Magi, and a somewhat less rare warfork known as the Taskmaster. Taken together, these items had a value to their buyers of just over $900. And now, as they say, the numbers. As if to swat my optimism of last night on its wet little nose with a rolled-up newspaper, today was my worst sales day in weeks. I started the day in the red, with chargebacks from two fraudulent PayPal payments knocking me down about $44, and I only just clawed my way out of the hole by the end of the day. Result: $1,086.69 in profit for the week, my best weekly posting so far, and still much too low for comfort. Let's break the situation down once more. I need to post a one-month profit of $4600 before April 15 to top my best month as a writer. My profits for the last four, record-breaking weeks total about $3780, so it's no use looking backwards. All hope lies in the week to come. With a running start of $3248 for the last 24 days, I'll need to make $1,352 in the next 7 days to hit $4600. The candidates are picked. The campaigns are underway. The Presidential election is set for this weekend... in Alphaville. Eighty thousand strong, Alphaville is a thriving online community ... with issues. Neal and his guests discuss virtual politics and economics. Guests include Edward Castronova, economist at Cal State Fullerton; and Julian Dibbell an online merchant. Airtime will vary, but they have me scheduled for five or six live minutes at 12:35 p.m. PDT, toward the end of the opening segment, so tune in a half hour before that to catch the whole thing, I guess. Update: The full show can now be heard on NPR's website. And Yet More Play Money in the News? Another red-letter day for revenues: $1150 in receipts, for a total of about $4150 so far this week. If I do the same tomorrow, my profits are sure to hit their target for the fiscal week. If I don't, I'm still in the game for April 15. Not bad. And yet I'm cringing now thinking of all the ways I betrayed the enterprise in the last few days. Going to see a movie with my mom and my sister and her wife, weeping through the surprisingly moving Eternal Sunshine of the Spotless Mind while inventory went untracked and unreplenished. Spending a day with my mother at her monthly oncology treatments while the desperate pleas of customers went unanswered. Talking to my wife and daughter and far-flung friends and family on the phone when my focus should have been nowhere but on this laptop stationed on the dining-room table in the middle of my sister's house. What would Donald Trump say? Who knows. But we may soon find out what National Public Radio personality Neal Conan thinks about all this, if rumors of my scheduled appearance on Talk of the Nation tomorrow at approximately 12:30 PDT aren't too greatly exaggerated. Watch this space for confirmation.